Winter is here – and things are heating up at the library! We’re having lots of fun events and winter challenges from January – February. Check out our schedule below for some winter fun at your library! Winter Reading is here for Adults, but this year there is something for kids as well! We have reading bingo cards for kids from preschoolers to teens! To get BINGO read 5 books that match the description of the box – and once you get five in a row you win a prize! Interested? Talk to Stephanie in the Children’s Room! 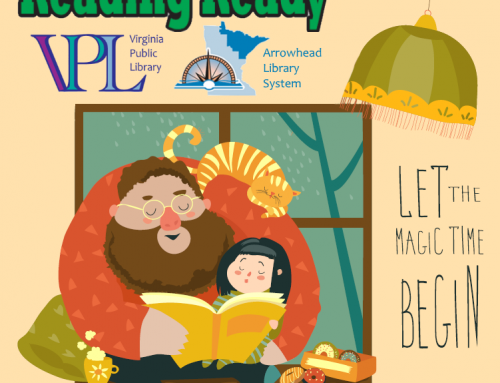 Storytime is back at the Virginia Public Library. Join us Fridays at 11:00am in the Library Auditorium for stories, songs, crafts, and fun! We have a different theme each week – so you can find new stories and songs to enjoy! Winter themes will include penguins, art, farm animals, and concepts like loud versus quiet. If you would like to see all upcoming storytimes visit our calendar page at this link! Duluth Playhouse – Theater for Young Audiences will be performing in place of our usual storytime on February 2nd. They will be performing a play about early science concepts suitable for preschool age children. We hope you join us in the Library Auditorium for some interactive fun! On the 3rd Tuesday of every month from 3-4pm we have a different event in the Library Auditorium for kids visiting the library. In January we will be debuting some new board games the library has acquired for our Children’s Room. If contestants are willing we might even have a game tournament! In February we will be having a Harry Potter party complete with craft, snacks, and trivia. There will be butterbeer! Check out our library calendar of events for upcoming 3TC events. Questions? Call or talk to Stephanie in the Children’s Room! Katie and Muggsie, the Tail-Waggin’ Tutors, are back again to listen to readers! These R.E.A.D. certified dogs will be at the library ready to listen to readers from 2 – 4pm. Registration is required for this event (so kids who sign up are guaranteed a free book and certificate) so please call ahead to reserve your spot! To see other Paws to Read times see our schedule of events at this link.